There is an array of research that seeks to create super soldiers. Back in 2010, a plan was announced to install transcranial ultrasonic mind control devices into soldiers' helmets in order to boost alertness, as well as relieve battle stress and pain. The Department of Defense has also been working on an augmented reality creation called iOptik, which would enhance a soldier's biology by offering simultaneous fields of vision, while enabling full data integration. Then of course there was T.A.L.O.S. an Iron Man-like suit that incorporates biometrics, liquid body armor that can change into bullet-proof solid skin, an exoskeleton for improved strength and speed, as well as the latest in augmented reality computing. There even has been discussion of genetically modifying soldiers to not require food and sleep. 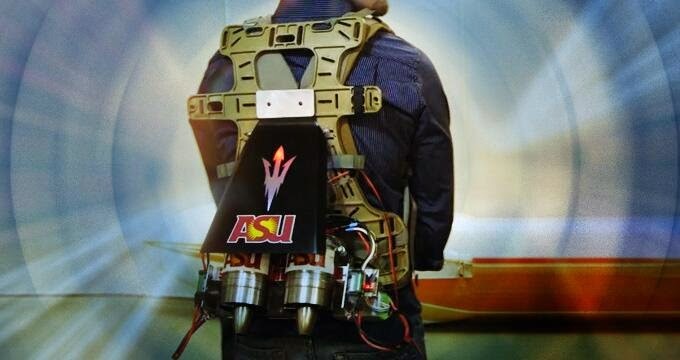 But no future soldier could be complete without a jetpack. The Arizona State University-DARPA project is called 4MM, for 4-minute mile. Similar to the goals of the Department of Defense's self-stated "Lucy" technology to create expert snipers from ordinary soldiers, the Jet Pack seen in the video below would create the highest level speed and endurance even where none existed before. Obviously, the mission to create drone-like humans continues ... full speed ahead.